As I'm sitting in the hotel room Brandon and I spontaneously decided to book minutes before the doors opened for the concert, I replay everything that has happened thus far. The concert, the ticket that a couple of gentlemen so graciously notified us that we did need tickets in order to attend the concert gave me joy to know for sure, I was going to see the band Scandal. After my mom's passing, seeing a band that I've been waiting to see for some time now is something bright and nice for a change. Let me tell you a bit about this band. Haruna is the lead vocals, and backup guitar. Mami is the lead guitarist and back up vocals) Tomomi is the bass guitarist and back up vocals, and finally but never least Rina is the drummer, and back up vocals. All girls wonderful in their own unique way. They met at a voice and dance school in Osaka, which coincidently my Japanese teacher's younger sister also attended for some time, but no she doesn't know Scandal personally. The band met at the school, and that was what sealed their destiny. We got in, and I have to say it general admission was not bad at all. Brandon and I had been sitting at the Rosemont Theater for 5 hours waiting for the concert to begin and that's because I didn't want to miss my chance to see them live. When they walked out on stage, the first they did was bow, and smile. No one has to tell you that they love doing what they do, and they love making people happy with their performances. They also tried to communicate with their audience numerous times as if to involve them with their performance which I have to say is something I haven't seen in many bands. This band by far, and I can't believe I'm saying this, but was the BEST PERFORMANCE at ACen that I have ever seen. The first song began to play, and I felt like I was hit with a big gust of wind because I was blown away when they began to Haruna began to sing because the sound was just..whoa. I mean literally I have no words to describe this concert, and how epic it was. Every hit on the drum, every strung of the guitars, my heart seemed to be keeping pace with them, and when I feel the band's insturments in my heart that means that I was in for an amazing show. Unfortantely, I did not get any photos due to their wishes, but that's what we have to do. Maybe this is all the fangirl in me typing but I can't help it. The band has captured me as they did others. No one dared to sit in their seats if they were truly there for the band. I, unfortunately, had to sit down from time to time but the screens on the wall gave me a good view of the band, and I could still hear them. It's not that I didn't want to stand, it's just I wore my combat books which seems to be the appropriate wear for concerts especially when you're standing on a slope. I wishI could type more because the band was just so alive, and amazing but honestly they left me completely speechless at the same time. Later today is the press conference and I will be updating on here. The interview questions however will be on a seperate page, as well as a video to be uploaded up onto my youtube. For those new to the band, you're missing out because this girl band knows what's what, and they are on a rollercoaster that's only going up. I've waited for about 4 out of the 7 years they've been here to see them, and I want to bring them back so please check out this amazing girl band. 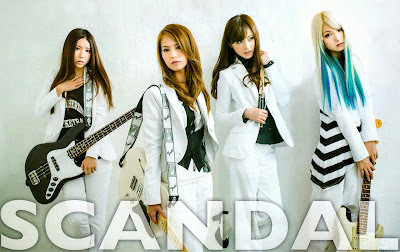 To Scandal: It was an honor to attend one of your concerts, and I hope you come back to Chicago.